… So directly to a Hill called Hob on the Hill which is the highest of the two Hills to the Bride Stones and from thence directly southward to a Stone called Craw Stone and so directly to Ravendale-head to a boundary stone there and from thence to a well called Leaden Well to a Hill called Colemanargus or Todhow and there Guisbrough and Skelton boundaries end. Note that Edward rode and was accompanied by 200 people. Quite a retinue. 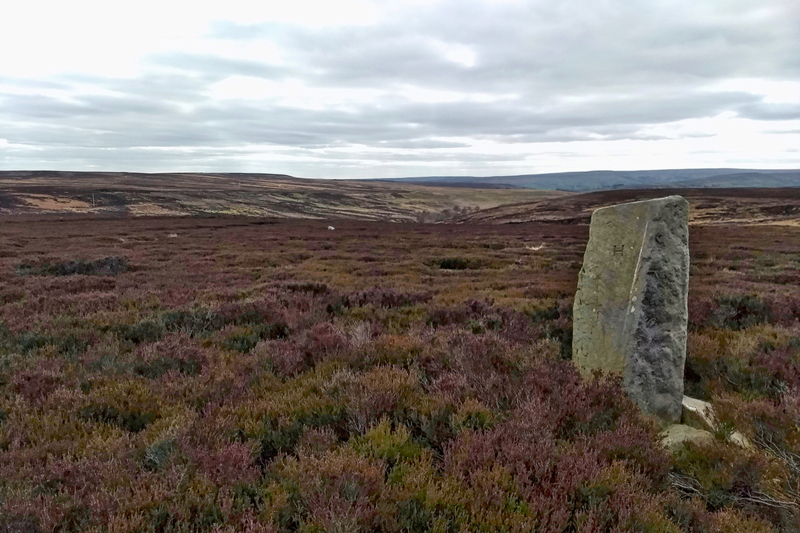 So today I followed part of Edward’s perambulation from Tod Howe to Hob on the Hill across Skeldewskew Moor (actually in reverse to the description above). Boundary stones aplenty, every 50 metres or so. I think this one is mapped as the Havelock Stone which presumably accounts for the ‘H’ inscription. On the other side is ‘RC’, likely Robert Chaloner, Edward’s four times great-grandson who died in 1855. Other stones are inscribed ‘TC 1878’; that would be Thomas Chaloner, Robert’s brother, who succeeded to the estate and title after Robert died without issue. So who was Havelock? I haven’t found any mentions except perhaps a George Havelock, a Guisborough clockmaker, 1700-30. Think grandfather clocks. But this family seems to have fallen on hard times for a century later Havelocks were applying for poor relief for clothing and to emigrate.